Find the dogs and go home. Not bad! 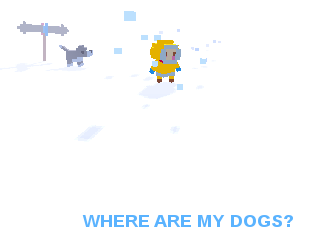 I liked the visual style and what little audio there was was pretty good - the ambient snow sounds were nice and the audio when finding a particular dog was nice. That said personally, I felt like the movement was far too slow. There is a very fine line between tension building pacing and it just being a crawl. The ending was okay, a bit underwhelming given the relative buildup. Also, and this is probably just my impatience (lol) but the transition between the fade to white and the ending was slightly too long. I thought the game just ended or had crashed there, thought it best to wait and check luckily. Overall, pretty neat.